My husband and I went to a Korean butcher in Flushing last weekend. 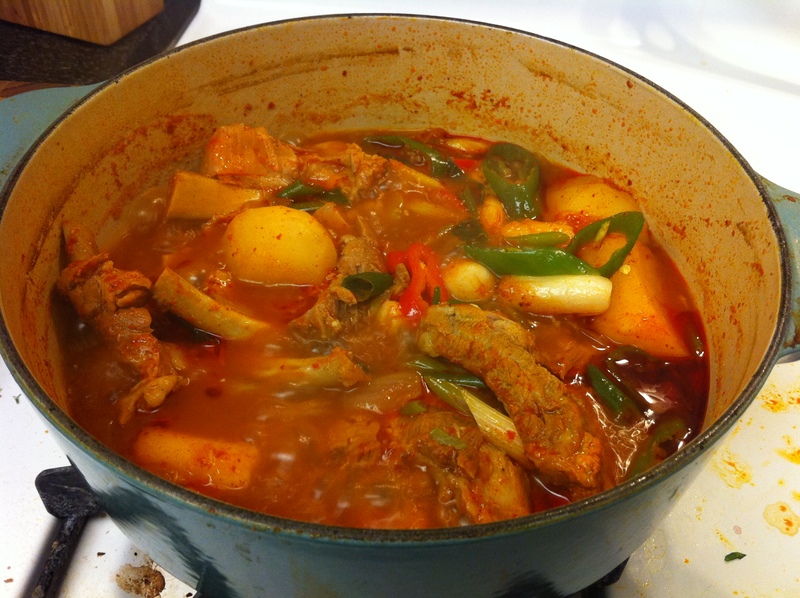 When he discovered pork ribs in the store, he asked “What do Koreans make with these?” I have made kimchee-jjim before with pork ribs, which I will post at a later time, but today I decided to make spicy dueji-galbi-jjim (매운돼지갈비찜). 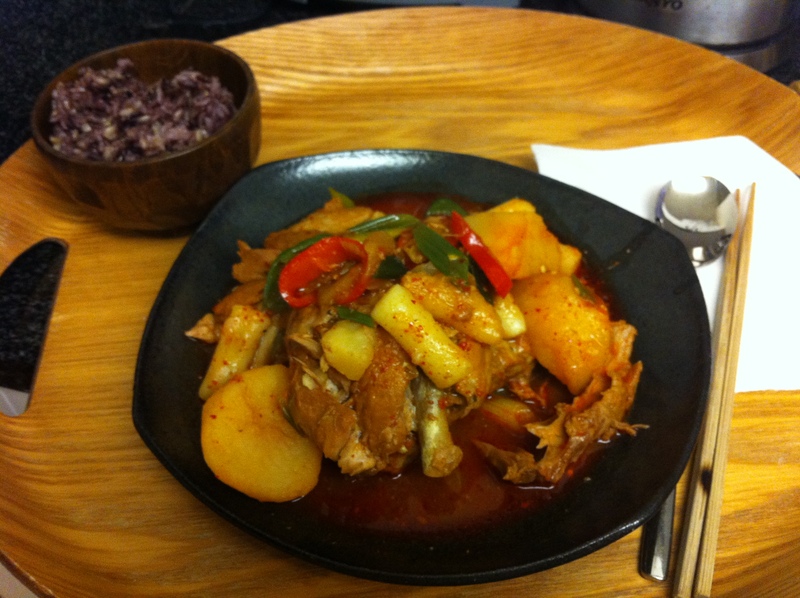 As you can tell by its name, spicy dueji-galbi-jjim is a spicy stew made with pork ribs. You can add any variety of vegetables such as potatoes, carrots and mushrooms. I used only one potato today since that was all I had. The greatest part was that I had leftover “Spicy Korean BBQ Marinade” from making dubu-kimchee about a week ago and simply used that instead of making a sauce from scratch. 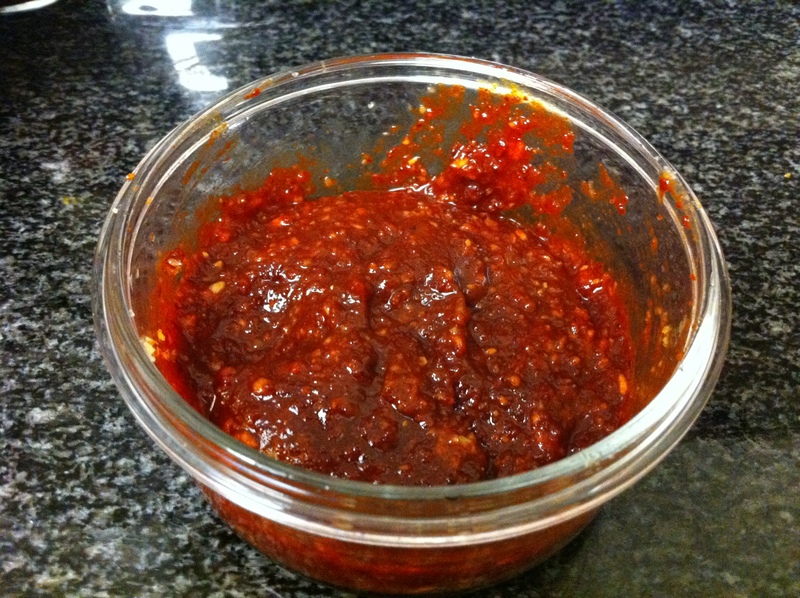 As I mentioned earlier, you can use this marinade for osam-bulgogi and dubu-kimchee amongst others. 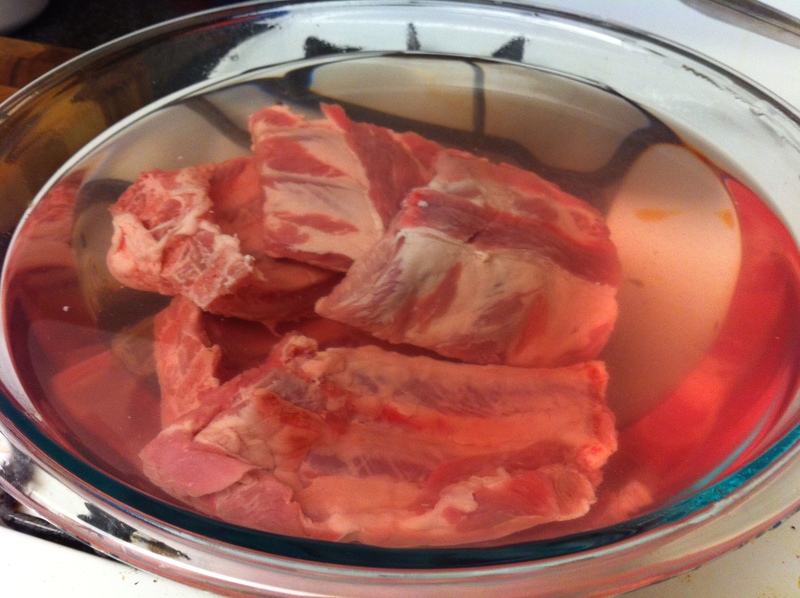 In a large bowl or pot, place the ribs in cold water. 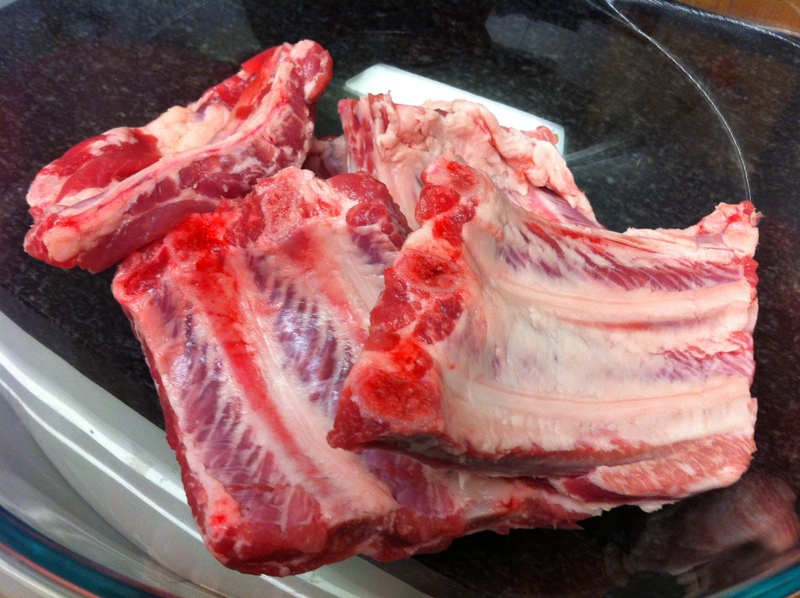 This takes out the blood in the meat and bones that can cause an unpleasant odor. Soak for at least an hour. Drain the water and place the ribs in a large pot and pour enough about 6 cups of cold water that it is at least 2 inches over the ribs. Mix in a tablespoon of duenjang, pieces of ginger and sake. 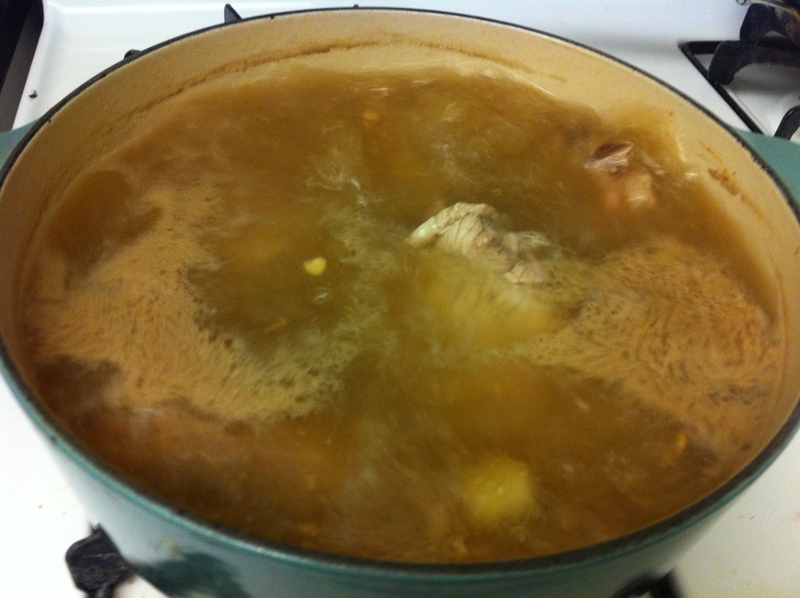 Duenjang, ginger and sake helps with the porky smell. It is also said that duenjang helps lower the cholesterol that can be consumed with the pork. Bring it to a boil on high heat and let it boil for about 10 minutes. Keep it uncovered so porky odor can evaporate. 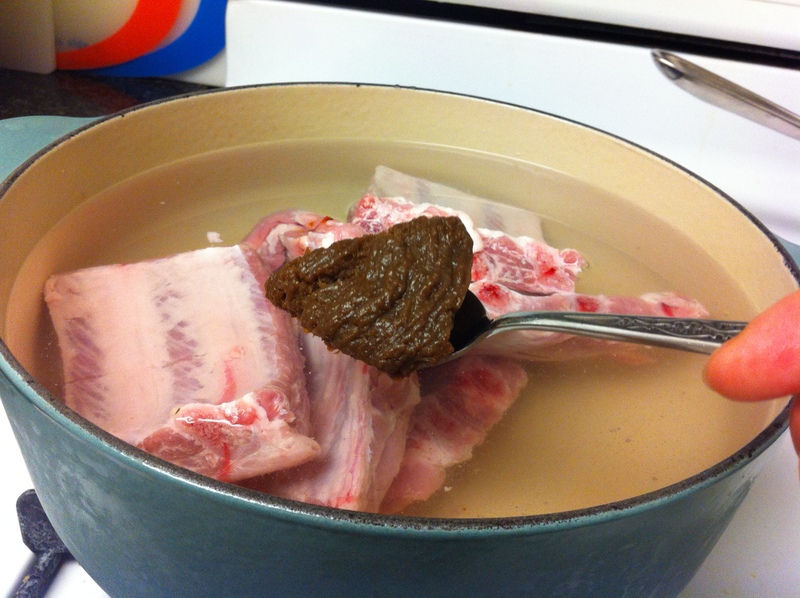 Drain the water once again and combine about 5-6 tablespoon of the marinade with ribs. Pour water just enough that the ribs are covered, about 4 cups. Add 2 tablespoons of soy sauce. Cover with a lid. Bring it to a boil and simmer. 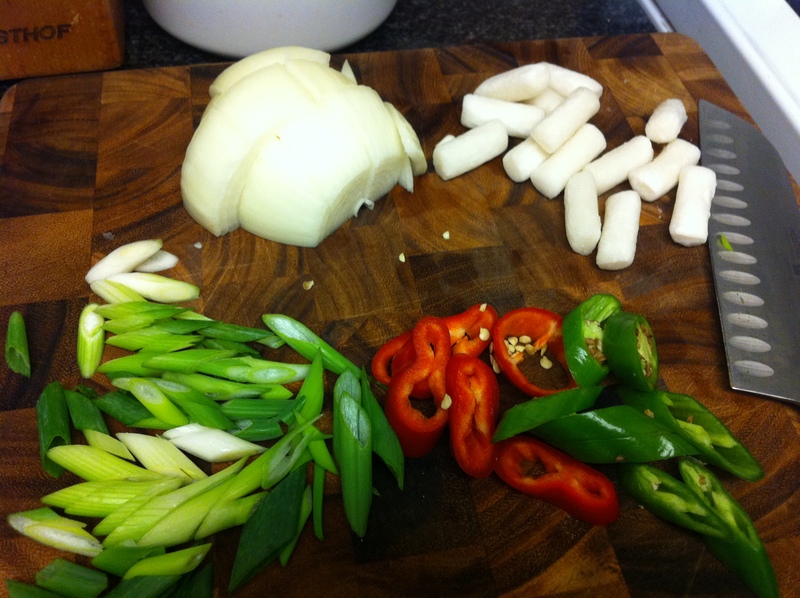 In the meantime, chop the onion, potatoes, peppers, scallions and any other vegetables you choose to use. When the stew has been simmering for about 45 minutes, add the onion, potato and rice cakes. Add carrots at this stage if you are using them. Cover with a lid and simmer for another 15 minutes. After a total of an hour of simmering, uncover and raise the heat to high. When the liquid reduces to about half the amount, add the rest of the vegetables. Taste and add the left over marinade if needed. If you add more marinade, cook for about another 5 minutes. Serve on a large place with a side of rice. This entry was posted in Good for dinner, Main Dish, Meat/Chicken and tagged Pork Ribs, Spicy Korean BBQ Marinade by gangnamkitchen. Bookmark the permalink.